Scientists at the University of Liverpool have achieved a remarkable advancement in directly transforming methane (CH4) and carbon dioxide (CO2) into chemicals and liquid fuels that can assist in reducing greenhouse gas emissions and also synthesizing precious chemical feedstocks. 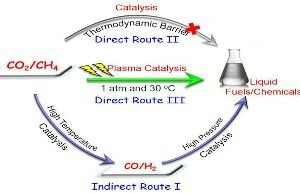 They have described a highly distinctive plasma synthesis technique for the single-step, direct activation of CO2 and CH4 into valuable chemicals—such as ethanol, acetic acid, formaldehyde and methanol—and liquid fuels with high selectivity at normal atmospheric pressure and room temperature in a paper published in Angewandte Chemie, a chemistry journal. The Researchers have demonstrated this technique for the first time because it is highly difficult to directly transform the two inert and stable molecules into chemicals or liquid fuels through one-step traditional (such as catalysis) techniques avoiding the need for energy intensive syngas production process, high temperature and high pressure syngas processing for chemical synthesis. The single-step room-temperature production of chemicals and liquid fuels through direct conversion of CO2 with CH4 was carried out by adopting an innovative atmospheric-pressure non-thermal plasma reactor including a water electrode and requiring lower energy input. This is a major breakthrough technology that has great potential to deliver a step-change in future methane activation, CO2 conversion and utilisation and chemical energy storage, which is also of huge relevance to the energy & chemical industry and could help to tackle the challenges of global warming and greenhouse gas effect. CO2 and CH4 emissions are regarded as greenhouse gases that cause climate change and global warming. A large proportion of CO2 emissions is caused due to combustion of fossil fuels for heat, electricity and transportation. CH4 is mostly discharged while synthesizing, processing, transporting and storing crude oils and natural gas. In the United Kingdom, nearly 470 million tons of CO2 is emitted per year. Of this, close to 39% is discharged by the chemistry and energy sectors. To overcome the worldwide energy challenges posed by greenhouse gases, innovative and developing techniques are being formulated at a fast pace. The fourth state of matter, that is, plasma, which is an electrically charged gas mixture, seems to be a prospective and propitious substitute for producing chemicals and fuels, thereby offering a distinctive method for allowing thermodynamically unfavorable reactions to occur at atmospheric conditions. In the case of non-thermal plasmas, the temperature of the gas continues to be low—nearly equal to room temperature—and the electrons are very energetic with a characteristic electron temperature of 1-10 eV, a temperature adequate for activating inert molecules such as CH4 and CO2 and synthesize a range of chemically reactive species such as molecules, radicals, ions and excited atoms. Such energetic species synthesized at a comparatively low temperature have the ability to initiate a range of disparate reactions. Plasma systems are flexible enough to be maximized and minimized. Moreover, higher rate of reaction and swift realization of steady state in a plasma process enables fast start-up and shutdown of the plasma technique in comparison with other thermal processes. This considerably decreases the overall energy expenditure and provides a prospective technique for the plasma procedure powered using renewable energy—such as solar and wind power—to function as an efficacious chemical energy storage distributed or localized system. This more propitious technique can prove to be a prospective solution to arrest gas flaring in gas and oil wells by transforming flared CH4 into precious chemicals and liquid fuels that can be stored and transported very easily. Nearly 3.5%, or approximately 150 billion cubic meter gas, of the global natural-gas supply is “flared” wastefully at gas and oil fields, consequently emitting over 350 million tons of CO2. The paper titled “One-Step Reforming of CO2 and CH4 into High-Value Liquid Chemicals and Fuels at Room Temperature by Plasma-Driven Catalysis” has been published in the journal Angewandte Chemie.